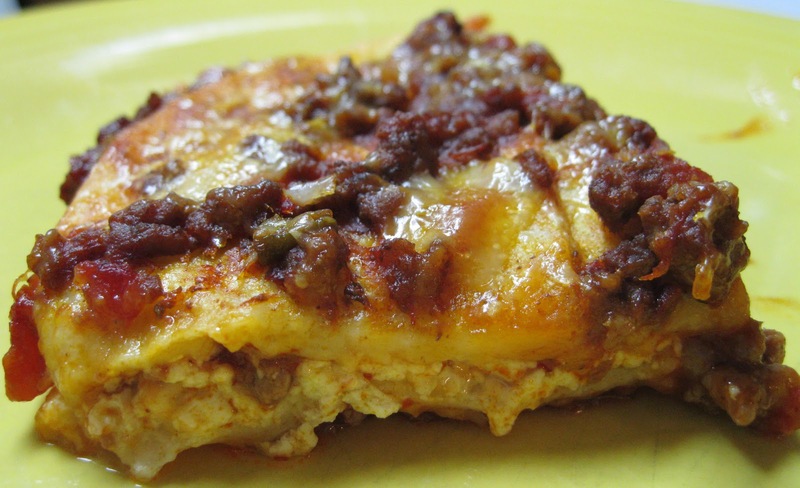 Talk about a twist on your typical lasagna. I may never go back to having traditional lasagna again! 2. In a large nonstick skillet coated with nonstick cooking spray, brown the beef and garlic over medium heat for about 8 minutes or until the beef is done. Drain any excess fat. Add the salsa, enchilada sauce, and salt and pepper (if using). Bring the mixture to a boil, then reduce heat and simmer for 10 minutes. 3. In a small bowl, combine the cottage cheese and egg white. Coat a 13 x 9 x 2 inch baking dish with nonstick cooking spray. 4. Spread a think layer of meat sauce in the dish. Layer with half the tortillas, all of the cottage cheese mixture, half the remaining meat mixture, and half the cheese. Repeat layers, omitting the cottage cheese layer and ending with the meat sauce. Sprinkle the remaining cheese on top and bake for 25-30 minutes or until bubbly. Let stand for 5 minutes before cutting. You can choose just how spicy or mild you want this dish to be. I went with the medium salsa. Even with the 6-inch tortillas, check the amount of carbs per tortilla. The ones I checked ranged from 15g all the way up to 22g per tortilla. Ole brand 6-inch tortillas are only 15g total carb per tortilla - net carb 13g. These actually taste good versus some of the low carb tortillas I've tried in the past. I had a 9 x 13 x 2 dish (hey, the dimensions are just in a different direction, but it all comes out the same in the end). At first I wasn't sure the ingredients would be enough to cover the size dish, as I had to spread it out pretty thin. Of course, not remembering that as it cooks, the ingredients fills in all those sparse areas in the entire casserole dish. Leftovers? Freeze well and just as good, if not better the second time around! Worth a try. It could add more texture. The only caution would be check the amount of carbs per corn tortilla.